Keri Ann Butler's life changed on the night she met movie star, Jack Eversea. She thought she knew a Jack that was very different to the man adored by fans the world over. In the wake of his betrayal and abandonment, Keri Ann has had to pick up and move forward with the life she was supposed to live and has put off far too long. Suddenly Jack is back, and his explanations for why he left seem more and more plausible, and his declarations more seductive. But being Jack's latest tabloid accessory isn't on Keri Ann's career agenda, no matter how much she is attracted to him. And how can she can ever trust him again? Jack knows he let the only 'real' thing that ever happened to him slip through his fingers. And his hands have been tied to try and stop it. Until Now. Forever Jack picks up exactly where the first one left off. In Eversea we were introduced to Jack and Keri Ann. 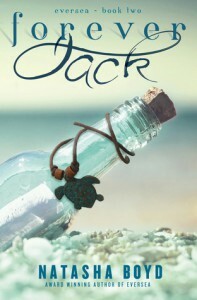 Jack is a famous movie star who ran from Hollywood to get away from a lot of problems in his life and wanted peace. Keri Ann has always lived in her small town in the South and had her share of grief when her parents and then Grandma died. Her brother is away at school and Keri Ann is getting by as best she can and one night meets Jack. They fall in love and it is a beautiful pure love. However, circumstances force Jack's hand and he has to leave and Keri Ann is devastated. Forever Jack starts where Jack comes back, and this time nothing is going to stop him from getting the only girl he has ever loved. Keri Ann can't believe he is back and does not trust Jack to not hurt her all over again. Jack was gone 5 months and while she understands what happened and she doesn’t want to give up on her wants and dreams. Keri Ann is afraid if she lets Jack in she may lose herself and just be the person who follows Jack from one movie set to another with no life of her own.